We are continuing to celebrate the Top 10 Videos of 2015 with the Fat Quarter Shop this week. Once again I thought it would be an excellent idea to participate. Everyone learns a little differently, visual, auditory, etc.. I learn by seeing something done and doing it. but there are times when a demonstration is the key to my success - no doubt. I think that is where my appreciation for the Fat Quarter Shop videos began. 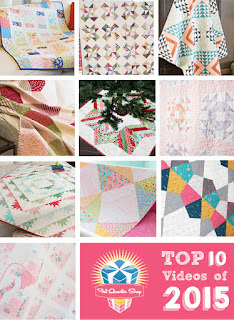 When I made the design boards by Lori Holt - I watched the video 3 times. I did. I know they are simple, right? well it was easier for me to watch how she did it vs. just pictures or words. So how does that relate to the post? Well this particular project, although very easy sewing, required me to watch the video a dozen times. It is a great video that accompanies the pattern. you need to buy and download the pattern from the Fat Quarter Shop. 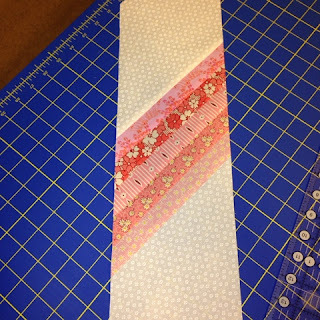 Grab a jelly roll and backing and you are on your way. 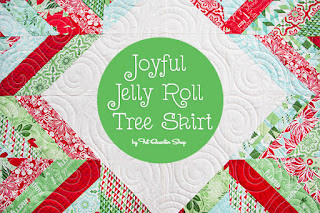 why does my title say a Jelly Roll Tree Skirt - the Spun Sugar way? Basically, once I reviewed the pattern, I decided a couple of things. It was after Christmas and although I could probably use a new tree skirt, what I REALLY needed was a Valentine themed tree skirt - only smaller. 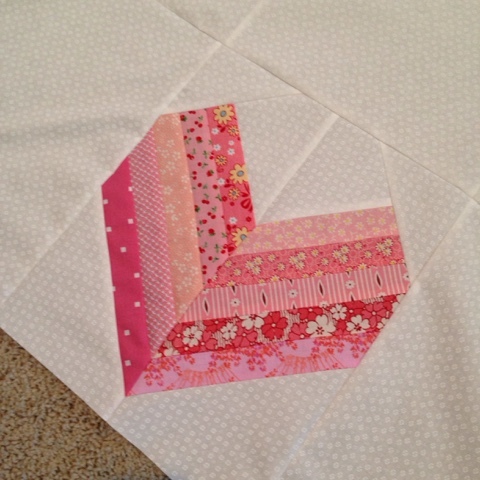 I thought, I would use thinner strips, in pink and modify a few other things. I used the video to help me with what direction I was placing my pink strips. before I realized what I should change to get them to go in the other direction. I'm telling you, the video is excellent and completely cleared up my confusion. So remember when I said I made modifications? I added connector corners to my blocks in the background fabric. Wham! a heart shape just that quick. I added a center and corner background pieces that matched my altered dimensions. Please don't ask what they were - I actually kind of winged it. 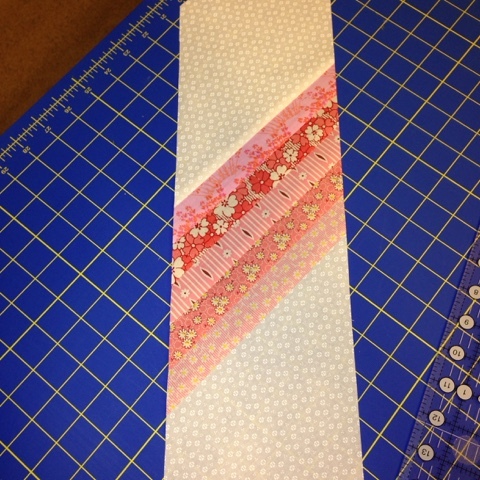 and if you do this with jelly roll strips - yours might vary as well. I realize that it isn't perfect. 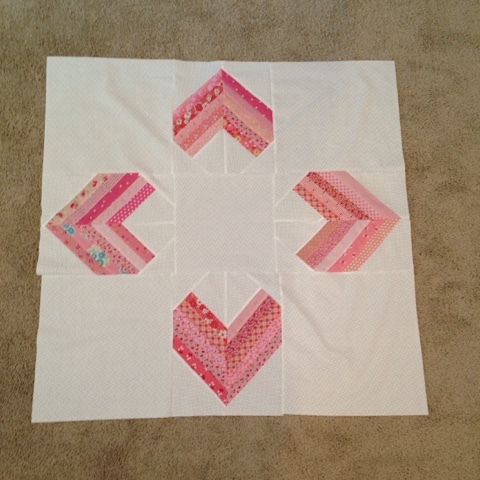 Most of the strips are on bias and that can lead to a little 'wiggle' of the quilt top. Over all I like where this is going. I need to quilt it, make a center circle cut for where the tree trunk will be and bind it. But I have a few more weeks before Valentine's Day. I did intend on finishing this for the post today. on my mini charm box quilt - who wouldn't? The Fat Quarter Shop would love for you to share your #joyfuljellyroll or any other #FQSTop10 quilts for 2015 on Instagram. For every #FQSTop10 post you do, you will be entered for a chance to win a Fat Quarter Shop $100 Gift Certificate! This fun contest ends January 31, 2016 and the winner will be announced on Instagram February 1, 2016. 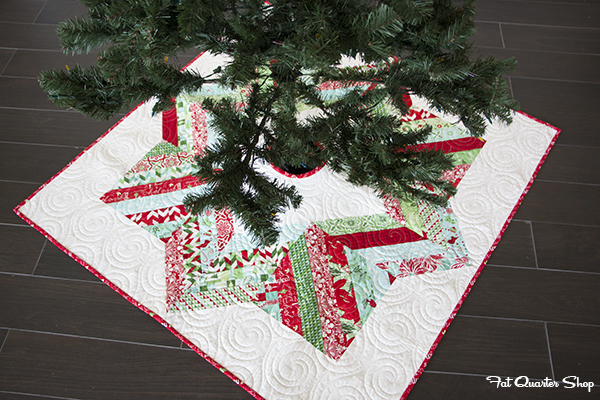 Good luck and happy quilting everyone! Great idea! It looks so cute!